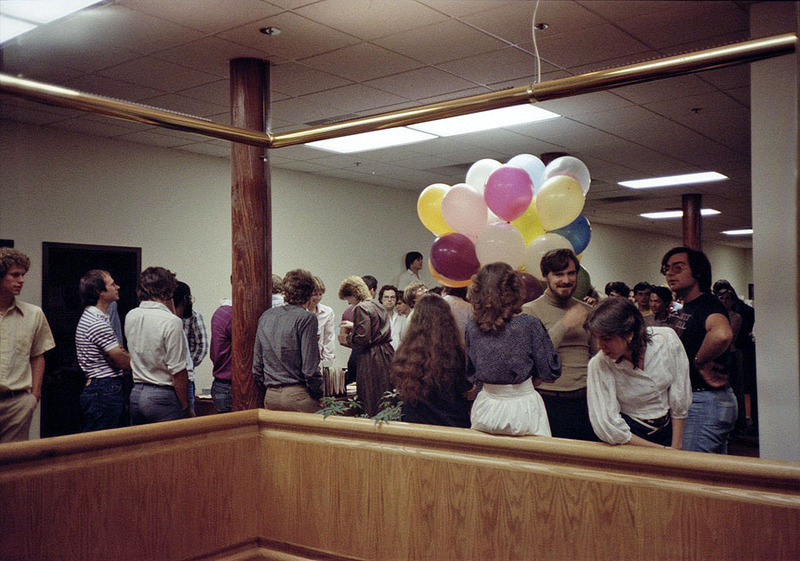 Another shot of that birthday party, and a face I can identify: RolandJ - tall, beard and moustache, "under" the balloons. 4th head in: Emanuel Washington, or just E, and two heads further in in the white shirt (partially obscured, just to the left of the woman in the green and red striped dress) is Dan Schwinn. Just on the other side of the same woman is Brad Parker, and then ARC and Betty R. before Roland. in striped shirt on left is Marshall Peck, one of the artists. Then again, not sure I got that name entirely right. Brad Parker, in glasses, dead center, looking at camera.